Murray N. Rothbard considered 'No Treason' (1867–1870) by Lysander Spooner "the greatest case for anarchist political philosophy ever written." 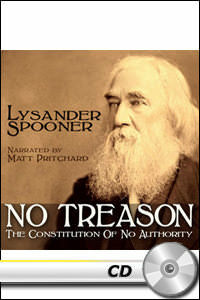 This audio is of 'No Treason 6' (1870), the third and last installment in Spooner's series (numbers 3–5 were never published). Narrated by Matt Pritchard.